Moxaverine is a drug used to treat functional gastrointestinal disorders. ↑ Mannhold R (December 1988). 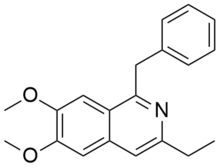 "Inhibition of calmodulin dependent c-AMP-phosphodiesterase by moxaverine and papaverine". Arzneimittelforschung. 38 (12): 1806–8. PMID 2854468.